Novox Caplets (carprofen) is the generic of Rimadyl. Novox contains a non-steroidal anti-inflammatory drug used to treat pain and inflammation caused by arthritis in dogs. They are fast acting and allow your pet to regain day-to-day mobility. 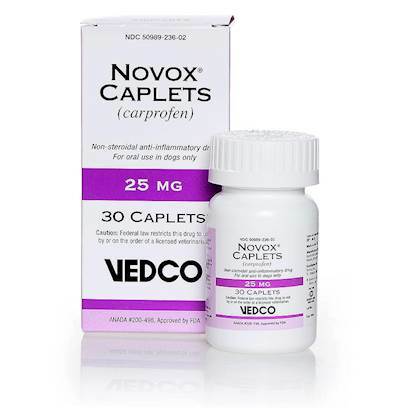 Novox Caplets are sold by per caplet. Rated 4.5 out of 5 by 87 reviewers. Works as expected. Great value! This product is just what our old "Chessie" needs. This product has helped our dog have more quality in her life. 50/50 chance it will work? Cheaper alternative to brand name! Novox helps my arthritic dog! Need to make in chewy, though! It has made a big difference in my dogs mobility. Novox is a great product. Being used with other combinations of pain meds. This product is easy to use and effective. Our 12 year old Rottweiler has benefitted greatly! My dog seems to be in less pain. Best meds, helps ease pain in my 13 year old dog - Max.